VZAccess Manager is a bloated piece of software that you don't need to connect your Windows computer to Verizon's network. 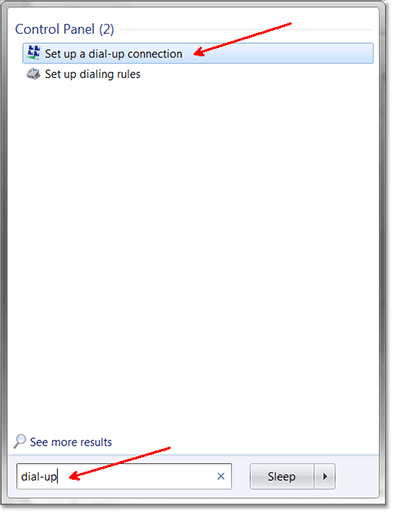 Not only does it sometimes interfere with other internet connections, but many people report faster connection speeds when using Windows dial-up connection. It's simple, and you'll connect faster. The only downside is that you'll lose the bandwidth monitor. Bandwidth usage is available in your account information. Don't be confused. Dial-up Networking (DUN) isn't just for ancient modems. It works equally as well with today's internet connected smart phones, wireless modems and access points. Leave the remainder of the fields as default (no username or password needed). You're almost done. Now you just have to connect using the network connection you just created. 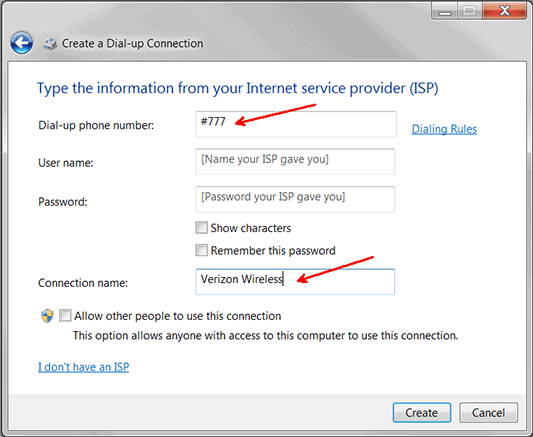 In Windows 7 you can click on the network icon in the system tray (next to the clock) and select Verizon Wireless under Dial-up and VPN. Or, you may wish to create a shortcut to this connection on your desktop. Open the control panel and manage your network connections. Right click the Verizon Wireless connection to add a shortcut on the desktop.